It's because you're both bigger than you realize. Fans accustomed to the loudest arena in college basketball are often disappointed by the sense that fans are sitting on their hands. In truth, even if they were screaming as loudly as they were in Allen Fieldhouse, they're filling at least twice (and probably much more than that) the volume of space. The image below was created by taking screen caps of Google Maps at the same zoom level. 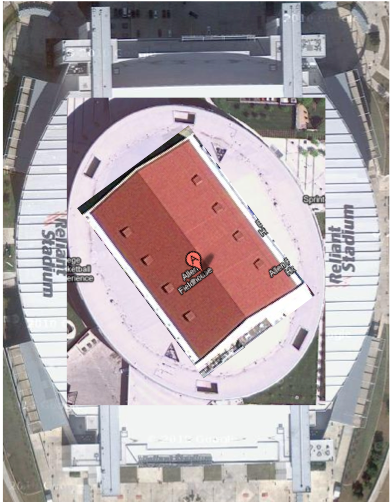 I rotated Allen Fieldhouse to the same orientation as the Sprint Center to make size comparison a bit easier. . EDIT: added Reliant Stadium. Scale looks a little different this time. But still ridiculous. These are the source maps for first two.